So that’s one for the bucket list, I suppose. On new year’s eve 2017, the boyfriend and I went to Times Square to watch the ball drop! Here are my experiences and what I’ve learned from it. About three weeks into our trip to Hong Kong, we made a trip to Korea! I just got back from my trip to Puerto Vallarta, Mexico! It was my first time in Mexico, and hopefully not my last because it was loads of fun! A good balance of do-nothing-days and activity packed ones. The resort we stayed at was Plaza Pelicanos Club, and it’s all inclusive with unlimited drinks (from either their bar, or either of their poolside bars), food buffet, and two more formal restaurants to choose from. Keep in mind that tipping is an extra expense you should factor in when you go to an all-inclusive! One thing I wasn’t expecting was the lack of air con. Except for our hotel rooms, the eating areas, as well as basically everything else, didn’t have air conditioning. Nonetheless, it was great having a private beach area, pools to choose from, and we even ended up getting a massage! The resort was nice. Again, only complaint was the lack of air conditioning, which I ended up getting used to halfway through my vacation. There are also vendors, usually dressed in all white to lessen the impact of the sun, who sold trinkets, snacks and henna tattoos on the beach, despite it being a private area of the beach. I’m guessing they have some sort of deal with the hotels. Anyway, I didn’t mind them. They do usually try to make eye contact and get you to look at their wares, but I thought they had cool stuff. 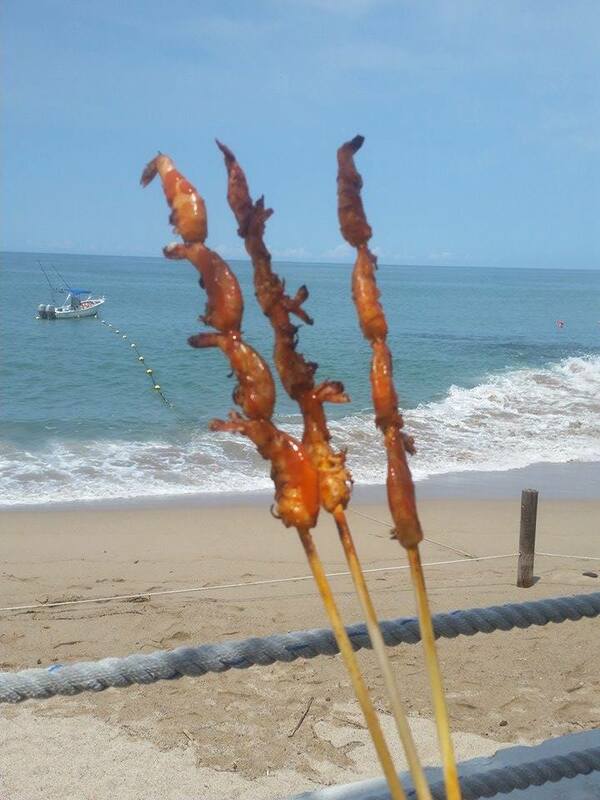 I never really bought anything from them except for skewered shrimp— these things are so delicous! By the end of my vacation, I had bought eight of these things. No kidding. The fresh lime juice, as well as the hot sauce, made these barbecued shrimps so amazing. In Puerto Vallarta, we did touristy things, as well as a few things that were probably not on a usual tourist’s to-do list. For one, we visited Pitillal, a nearby town where all the locals lived outside of the hotel zone. My boyfriend and I bussed to the town, first getting on the wrong bus, then finally on the right one. You can bet we were sweating buckets. In the town there were loads of vendors, many that sold clothes, reminding me of Hong Kong’s street stalls. There were many restaurants, offering fresh tacos, morning gruel (I actually don’t know what the locals were eating in the mornings, but it seemed to be some sort of congee/oatmeal mixture? ), and cold drinks. We walked around, admiring the low key architecture, and marveling at how many animals ran stray in the streets! Our trip to Pitillal was very tiring, but I’m glad we ventured out! We also visited a few malls in Puerto, including Plaza Caracol, which was about 2 blocks away from our hotel. We frequently walked over there after the sun set, since they’re opened quite late and walking at night is so much better than the morning! We also went to Gallerias Vallarta, which although looked quite fancy, wasn’t super exciting. I liked Caracol more, because it feels more authentic. There’s small stores selling clothes, shoes, candy (for cheap! ), whereas Gallerias was taken up by Liverpool, a huge department store, and had more name brands that we were already familiar with. In my next posts: ATV-ing, Cafe Des Artistes, and downtown Puerto!